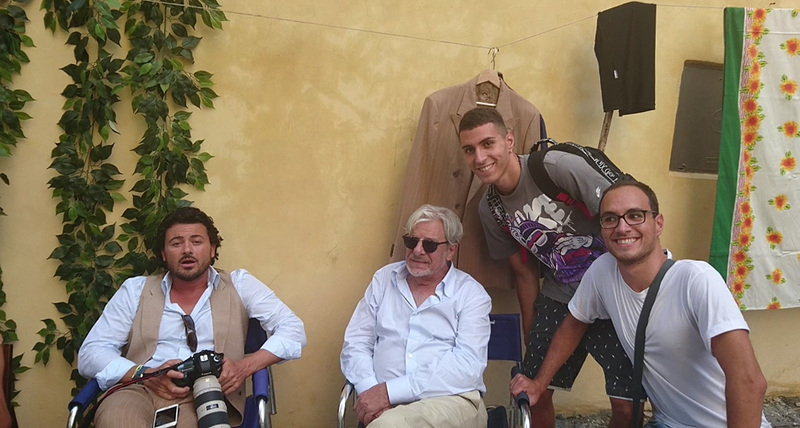 Acting with Giancarlo Giannini, what a thrill! Several months ago, Caruso, a company known worldwide for its great quality men’s clothing (headquarters in Soragna, in the province of Parma) contacted me for a meeting. And so, I met Umberto Angeloni, President and Ceo of Caruso who offered me to shoot the third chapter of “The Good Italian”, a brilliant marketing operation which has the actor Giancarlo Giannini as a testimonial. Yes, exactly him: the celebrated Italian these who, despite being famous, does not act like a star, the performer who won many awards (David di Donatello, Nastri d’argento, Golden Globe and a best actor Oscar nomination for the movie Pasqualino sette bellezze, “Seven Beauties”), the voice of the most excellent American actors, the dubber most loved by Italians. The art direction of the advertisement was made under Adriano De Santis, Director of Centro Sperimentale di Cinematografia in Rome, the best of the best, a hotbed for talented directors as, for example, Gabriele Muccino. In my professional life, it is not the first time in front of a video camera: I performed in short TV commercials, food shows, including also important collaborations as the one with the BBC, but my participation in a film set of greatest significance like this one was a unique and unparalleled experience: it is amazing and magical to work with many cinema workers (directors of photography, set designers, costume designers and many others).